A group of bloggers took a road trip to Visit Winona last weekend to take in the Great River Shakespeare Festival. 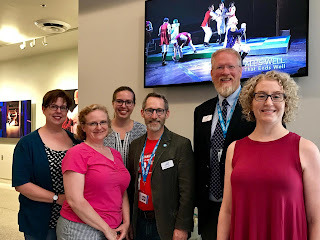 We had a great time and enjoyed some fantastic theater and wonderful conversations, including learning about Intimacy Directors International. Click the links below to find out why you should consider a mini theater vacation this summer (four shows plus an intern/apprentice performance running through August 5). "Not only is the theater entertaining, engaging, relevant, and well done, but the festival is well organized and provides many other opportunities for entertainment and engagement throughout the charming river town of Winona." "Seeing shows in rep was very fun and something that I had not had the chance to experience before. It adds a new layer to the theater going experience, to be able to make connections between the different shows." "Friends, we LOVE the theater festival experience... Great River Shakespeare Festival is right in our backyard, and it's a gem not to be missed!" Pictured: Carol and Julie from MN Theater Love, Laura from Twin Cities Stages, GRSF Artistic Director Doug Scholz-Carlson and Managing Director Aaron Young, and Jill from Cherry and Spoon.